Just came to post the same thing. Shame the arcade collection doesn’t include Jackal, Simpsons, X-Men, or Ninja Turtles. I guess due to licensing issues for the latter three. Does Konami do physical releases in Asia/Japan, but no other markets? Similar to Capcom? Or is their reputation worse than Capcom when it comes to physical releases? I'd be all over the anniversary editions they just announced if physical anywhere in the world. It doesn't look good honestly. Super Bomberman R is Konami's lone release on Switch and it was globally. Yu-Gi-Oh Legacy of the Duelist was announced previously for a release in Japan. But a physical release hasn't been confirmed for it as yet. @Magician Thanks for your comments on this. I am still going to hold off on digital on these - possibly add them to my wish list and if they have a 'fire' sale on them, get them cheap, otherwise not at all. It was supposed to get a physical release for like two years now, still hasn’t happened yet lol. They did manage to put out an Xbox One case with a digital code inside though. That is weird. Especially considering the Asian release of Girls und Panzer does support English. I got it through PlayAsia. I have pre-ordered Bloodstained Curse of the Moon from Limited Run Games … I just couldn't help it! Mutant Year Zero is available to pre-order on Amazon. This is awesome. Aside from Mario+Rabbids, Mutant Year Zero is the closest Switch owners will get to XCOM-style, tactical rpg games on Switch. Until 2K wakes up and ports the XCOM series to the Switch anyhow. And this is also impressive for the publisher Maximum Games. Their previous choice of game to publish, Troll and I, was not a good game. STAY is available to pre-order now via Red Art Games. There will be a custom made figure giveaway. One winner will be chosen among the pre-orders. Do we have a confirmation that LRG is doing the Messenger on their own or is it a tandem with SpRG? "This release includes Limited Run Games exclusive cover art, full-color interior art, and a 24-page booklet." @Belexes - That's fair. Just needed to know if I had to buy a second since LRG I have been buying two of each of their releases and plan on selling the whole lot together by the Switch's lifespan end. All others I buy 1 of for myself. Just needed to make sure what my steps are going to be. From my understanding The Messenger had two separate releases. Special Reserve also mentions the manual. I don’t think there are honestly any differences other than the cover art and the Special Reserve box. 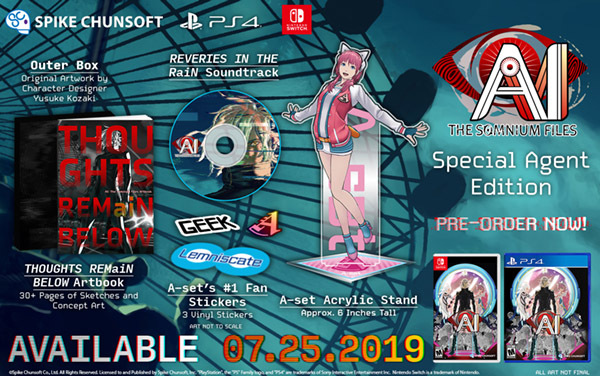 A look at the $90 special edition of AI: The Somnium Files. Open to preorder now at Amazon NA. P.S. - Kill la Kill is open to preorder at Amazon NA. P.P.S - Little Friends: Dogs & Cats is open to preorder at Gamestop. Previously, I wasn't sure if this was getting a physical in North America. Cities: Skylines has been rated for a physical release via THQ Nordic. Cities: Skylines Nintendo Switch Edtition (#Switch) from @ColossalOrder and @KochMediaNordic is rated #EforEveryone! My copy of Fox N Forests arrived. Kinda bummed there’s no manual or anything inside. Still waiting for mine. This took forever. I ordered my copy super late. Figured I’d be one of the last to receive it.